Matsya Jayanti observes the birth anniversary of Matsya (fish), the first incarnation of Hindu Lord Vishnu during Satya Yuga. People in India celebrates Matsya Jayanti on the third day of 'Shukla Paksha' in the month of 'Chaitra' as per the Hindu lunisolar calendar. The celebration falls during Chaitra Navratri and coincides with the Gangaur festivity. To those, who are wondering the rituals about Matsya Jayanti or if carry minimal idea behind the celebration, below we have provided every detail of this auspicious day. Know the Matsya Jayanti 2019 date, puja rituals, significance, mythological stories attached to the celebration of the birth anniversary of Matsya. Matsya Jayanti 2019 is an important day for the Hindu community. Along with the celebration of Chaitra Navratri and Gangaur, excellent courses of actions and pujas are performed in Lord Vishnu temples everywhere across the nation. The rituals and significance are extremely auspicious among the devotees of Lord Vishnu. 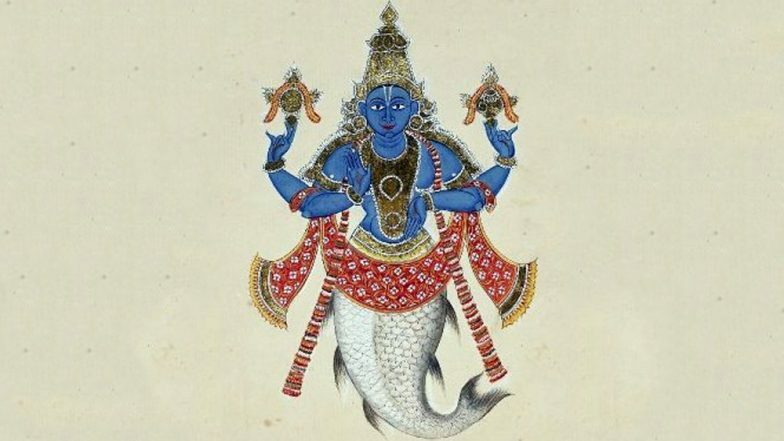 The Matsya avatar is worshipped as a four-armed idol with the upper torso of a human and the lower of a fish. Everything About the Bengali New Year. Every year, depending on the Hindu lunisolar calendar, various festivities take place. As the New Year, begins, on the third day of Shukla Paksha in the first month of Chaitra, Matsya Jayanti is observed, This year, Matsya Jayanti falls on April 8. Special puja rituals are organised in Lord Vishnu temples. There are several theories behind the celebration of Matsya Jayanti. The earliest account states that Matsya Avatar was the first of the ten incarnations of Hindu Lord Vishnu. He warned King Manu about the universal deluge and saved the universe from the demon 'Damanaka.' Again there are many versions of the Matsya mythology in the Puranas. However, the names of the characters, the details, the plot and the message diverge in this genre of texts. Although, there is no mention about the rituals, traditions and customs to be followed on Matsya Jayanti, the festivity is observed with much enthusiasm. Devotees worship Matsya, with immense devotion and dedication. According to Srimad Bhagavatam, all the sins of the person who reads or listens to the Matsya Purana will be destroyed. On the day of Matsya Jayanti, devotees keep fast to please Lord Vishnu. The vrat commences from the previous night, and the observer avoids eating, while some indulges only having fruits. The religious fast continues until the sunrise of the following day. Vishnu followers stay awake on the night of Matsya Jayanti and chant Vedic mantras, which is regarded to be very promising. The Nagalapuram Veda Narayana Swamy Temple in Andhra Pradesh is the only temple in India, which is dedicated to Matsya Avatar of Lord Vishnu. The festivity here is grand and special gatherings are organised on Matsya Jayanti.